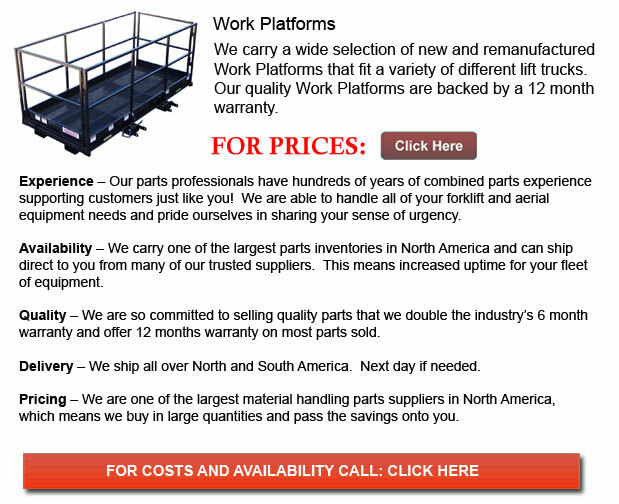 Work Platform - Forklift platforms add more flexibility for those who need to reach elevated heights utilizing their forklift. These platforms will make it easier for workers to work effectively and safely at high levels. Forklift platforms are an economical solution for businesses in view of the fact that they are a lot more cost effective as opposed to obtaining specialized machines. These platforms are even desirable for the reason that they can save a lot of storage space. To maximize the advantage and full potential of this machine, you will need to find the lift that best suits the work projects you have in mind. Slip-On platforms are simple to set up because all you do is slide them onto the lift truck, lock them into position and they are set to operate. Slip-on style attachments have gained enormous popularity because they are easy and quick to operate. They provide an inexpensive solution for businesses that do not require them regularly. These platforms have a railing system in position, tie offs and skid proof decking available. They still require the use of safety machines by workers but come with these particular features in order to further the safety of those who will be using them. Slip-on work platforms are an ideal option for those projects which take place in difficult places or over top of an object. A pin system secures this particular kind of platform onto your forklift after sliding the platform on. The industrial lift table offers extra protection since they are outfitted with railings on three sides and a safety screen in the rear. For extra safety, it is a better idea to consider choosing a style which opens through the front railing as opposed to the side gate model. Stock pickers could mount onto a forklift with the same foundations as the other platforms though they are somewhat different. Stock pickers have a slighter base surrounded by barrier on three sides and its security screen is situated on the front. This model differs from the other platforms because the surface and the cage do not take up the whole fork surface area. Combination platforms have proven to be extremely useful whenever employees have to work with supplies a height. This style of platform has a smaller and larger section. This design is significant so that employees could finish their task and not have to concern themselves about any supplies sliding onto them if the individual operating it tilts or tips the things. There are a lot of accessories existing which could attach to your platform in order to improve its performance even more. For bigger supply items like for example piping, tall racks equipped with their own guardrails are an exceptional alternative. These racks keep supplies like pipes, brooms as well as other things from falling off of the platform and hitting other staff. For additional efficiency, there are toolboxes, trays and tools designed to attach directly onto the side of the guardrails.